[What about Slave Labor? ], [Will there be a shortage?]. The Cacao tree grows to 15 meters, but cultivated ones are usually kept down to 6 meters to make it easier for people to harvest the fruit -- in addition, the lower branches are all removed to allow workers to move through the grove easily. 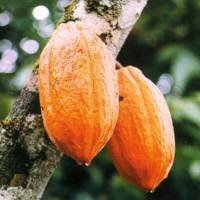 The large colorful fruits (Cacao Pods) grow close to the tree; different varieties vary significantly in shape, texture and color. A ripe pod can be left on the tree for 2 or 3 weeks without spoiling; allowing plantations to harvest every couple of weeks instead of daily. Although it will not open and lose it's seeds when overripe, it is important for the flavor that it is harvested only when ripe. The tree flowers and fruits at the same time, there are always flowers and always ripe pods, so harvesting is done almost year round, although there are generally two peak times in the year and the main harvest is near end of wet season. The pods are harvested by hand using a machete. Great care must be taken; since leaves and stem sprouts grow where the fruit was, the continued growth of the tree depends on avoiding damage to the Chupon. It is not possible to harvest the pods by machine. The harvested pods are taken to a processing location very close to the trees, usually only a few meters away, and each fruit is opened with a machete, a whack from a piece of wood or even by knocking two pods together, so that the pulp and seeds can be removed. The seeds are surround by a sugary mucilaginous substance that must be fermented off before they can be roasted & processed. There are generally 50 to 60 small (3 cm x 1.5 cm) purple seeds in each Pod, although that can vary considerably from 20 to 100. The Crillo variety has the fewest seeds. The seeds can be kept for up to 24 hours after removal from the pod. The raw seeds are tough and bitter -- fermenting brings the aroma and taste as well as cleaning off the residue of the pulp. Before fermenting, the seeds themselves are also split opened. Although i have not yet found information on how this is commonly done, i have read about some Amazonian villages where the local workers eat the pulp and crunch the seeds and spit them out without eating them!! The opened seeds are spread in large heaps, often right next to the grove of trees they came from. They are left to ferment lying on, and covered with, banana leaves. (Sometimes also in baskets or boxes or under grass roofs.) The fermenting seeds need air and create heat, so the batch must be turned several times during this process. The purple seeds turn brown during the fermentation period. Fermentation takes about a week -- although depending on climate and variety it can be as little as 2 days or as much as 10; the Crillo variety ferments for a very short time, Forastero for the longest. The seeds are dried for a week after fermentation. During both the fermentation and the drying, care must be taken to protect the seeds, which are still essentially outdoors, from the constant rain of the climate that Cacao lives in. 100 kilograms of seeds, dry out to 45 kilograms of Cacao Beans. Yields of 1000 kilogram per hectare are normal, but yields do range considerably, from 220 kg/ha to 2200 kg/ha! A standard 100g 70% Chocolate bar contains 80 to 85 beans, or the seeds from about one and a half Cacao Fruit. A standard 30g 10% milk-chocolate-candy bar (such as Hersheys®) contains 6 Cacao Beans, or about 10% of a pod. In the late 1990s raw Cacao Beans were selling for about $1.50 per kilogram (in 1977 they reached almost $9.00!). There are a growing number of small family and village run Cacao farms, but the vast majority of commercial Cacao is grown on extremely large corporate plantations where working conditions range from barely decent to completely inhuman. Terrible working conditions are, unfortunately, the norm rather than the exception. Cacao prices are very low, and as long as they are kept low, corporate profits will be high -- but the some plantations use this as an excuse to use slaves. It is easy to say that this is only in west Africa, and that this is only low quality Cacao; but it is clearly an industry problem. Many companies make an effort to avoid slave Chocolate, however the five largest manufacturers of milk-chocolate-candy (Nestlé, Hersheys, Mars, Cadbury & Phillip Morris) do not. They claim that they have no control over the problem. This is obviously not true. You should avoid these companies at all costs. Allegations have been made for years that child slaves are used extensively in Cote D'Ivorie (by far the largest exporter of Cacao). The large candy companies, first denied it, and then tried to distance themselves from it. have documented that tens of thousands of children aged of 8 to 14, from poorer neighboring countries have been sold into forced labor on cotton, coffee and Cacao plantations in Cote D'Ivorie/Ivory Coast in recent years. In August of 2001, even the US House of Representatives got on board, overwhelmingly passing New York (D) Representative Eliot Engel's legislation, requiring "slave free" labels on Cacao products. Finally, on November 30, 2001 the Chocolate Manufacturers Association, frightened by the prospect of boycotts and regulation, agreed to help establish a foundation to help eliminate the worst of the problems over the next 5 years. Although this small step is generally not seen as solving the problem, it stopped the Congressional action. The problem is primarily with the Forastero variety from West Africa, and that is only in the lowest grade Chocolate -- milk-chocolate-candy and other products. Pure Chocolate bars usually use the Crillo or Trinitero varieties and often avoid the Cote D'Ivorie harvest. But not always. Some add the cheaper Forastero to the mix to lower costs. In any case, most of the workers harvesting Cacao live a subsistence life to provide our luxury; they are paid a tiny fraction of the profits. Because supporting those worker run Cacao farms is absolutely vital, finding FAIR TRADE Chocolate is extremely important. Ask for it everywhere you buy Chocolate. If you want to avoid slave Chocolate -- Avoid Hersheys. In addition The big 5 Chocolate companies are supporting a British petition to the WTO which would throw out regulations in most countries (including the USA, the EU and Russia) which forbid the substitution of vegetable fats for Cocoa Butter (and dairy) in candy bars. It is all about cost, the lower the amount of Cacao, the cheaper the bar is to make. It is important to keep these regulations in place! Why bother with Organic Chocolate? Many Cacao plantations use large amounts of chemical fertilizers and pesticides -- Cacao is one of the world's most heavily sprayed food crops. This is terrible for the forest, the forest's residents (plant, animal and human), the surrounding vegetation, the Chocolate and even, in some cases, the actual Cacao trees. Organic (and Fair Trade) Cacao plantations give more consideration to the overall health of the forest as well as the purity of the product and health of the workers. Fat holds pesticides, and other chemicals, extremely well and Cacao contains large quantities of coco butter, which is fat. All of those pesticides are stored in the fat and delivered to you directly. For these reasons it is very important to try to buy organic Chocolate. Organic Chocolate actually tastes better! The distinctive, fruity, unpleasant taste many people associate with organic Chocolate is due to the non-refined fruit-based sugar that many of them use, not the Cacao. Try Green & Blacks!! It is the best Organic Chocolate i have ever had. Will there be a Chocolate shortage? The large Chocolate candy companies have been warning of an upcoming Chocolate shortage for a number of years now. Although this sounds like a marketing strategy or an excuse to drive up prices, it does appear that consumption is growing rather rapidly. However much of that increase is driven by the introduction of new products, which hardly seems to indicate impending shortage. And low Bean prices due to overproduction also seem to put the lie to the claim of shortage. Three thousand years ago the Americans who lived in the native range of Cacao knew that small plantings of Cacao at the edge of the rainforest, mixed in with corn, vanilla, yucca and other food plants, would provide the highest yields of prized Cacao Seeds. But for a couple of centuries now the Chocolate industry has focused on growing Cacao on plantations cleared from the rainforest. Growing away from it's native environment, without the canopy and detritus on the forest floor the tree has been moved away from it's pollinators, midges which live in the decaying matter in the shade of the canopy on the forest floor. Because of this reproduction has been seriously damaged. The Chocolate companies have been worrying about a shortage because they think that Cacao cannot reproduce effectively, but it's only on plantations that the reproduction rate is low. There have been public suggestions that a way to avert the "upcoming shortage" AND help eliminate cocaine while not impoverishing the farmers in the tropics would be to convert the coca plantations to Cacao. I really like this idea, however logistical, economic and political problems aside, i am not certain that the habitats coincide well enough for the conversion to actually work biologically. [Harvesting the seeds], [Why Organic? ], [What is Fair Trade? ], [Will there be a shortage?]. [top of the Harvest page], Return to Selection Bar.